Posted on May 23, 2012	by Lou Murray, Ph.D.
Oh how I wish that these strawberries were from my own garden. But they’re not. They’re farmer’s market strawberries. My entire strawberry harvest this week went onto a bowl of cereal this morning. I can only dream of the day when I might have enough of my own berries to make preserves. But the lemon that went into the jam was my own. While strawberries are in abundance at farmer’s markets, why not try making your own jam? It’s surprising easy, a lot cheaper than store bought jam, and there is no high fructose corn syrup or mystery ingredients. Step 1 is to start your boiling water bath as it takes a while for all of that water to come to boiling.You need a pan that is deep enough to hold all of the jars standing up, and still have an inch of water over the tops of the lids. I cut the berries into quarters. Some people like to leave them whole. While the berries, sugar and lemon juice are cooking, I wash the canning jars and lids. I boil the lids and rings for five minutes to sterilize them, but I just let hot water sit in the canning jars. Sometimes I run the jars through the dishwasher before starting to make jam, which gets them clean and leaves them hot. Wash, hull and cut into quarters 1 quart of strawberries. That is two of those little green plastic containers full of berries. Note that this is a heaping quart cup. There is a lot of air space in there, and jam making isn’t an exact science. You can see the grated lemon peel just under the letter G in glass. Put the berries, lemon juice and grated lemon peel into at least a 2-quart pan (3-quart size is better since it has a tendency to boil over in a 2-quart pot.) 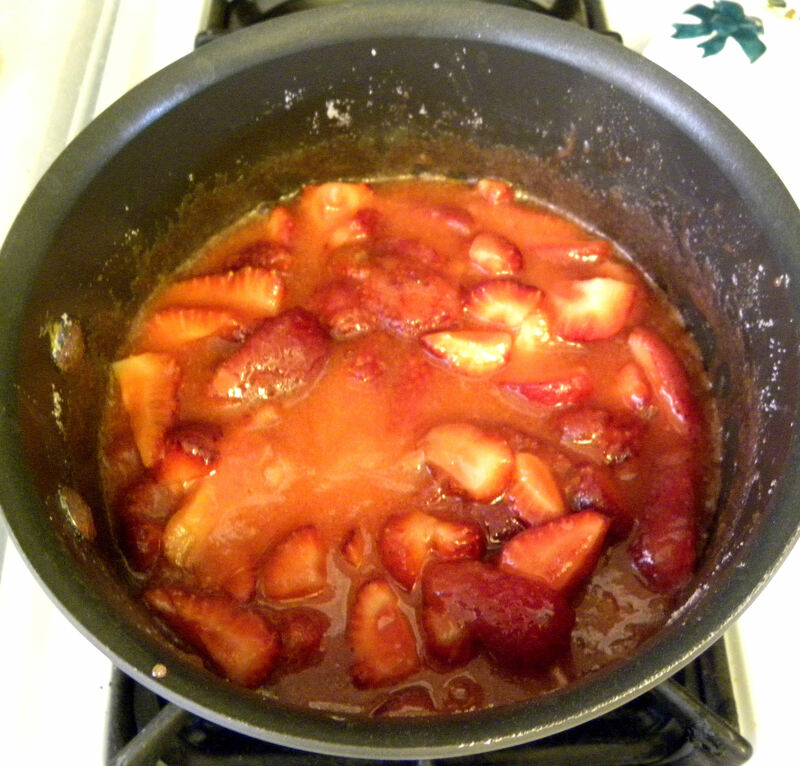 Add four cups of white sugar to the strawberries. Stir over medium heat to dissolve sugar. The sugar is still not quite dissolved in this photo. 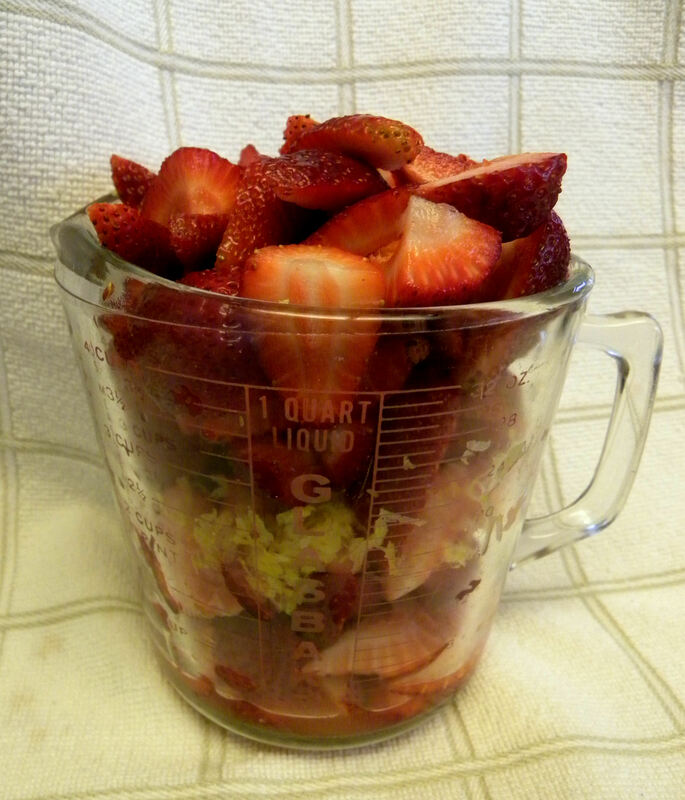 All of the liquid is from the strawberries (and the tiny bit of lemon juice). With luck, that will be my first embedded video that was directly embedded into the post rather than going on You-tube first. It shows the jam at a rolling boil. Cook the jam with stirring for 15-20 minutes. It doesn’t get as thick as jelly. You can drop some on a cold plate to see if it is set up as well as you want. Turn off the heat under the berries. Skim the foam off of the jam and discard. Ladle the jam into the six 8-ounce clean, hot jars, leaving a half inch of air space at the top of the jar. Wipe the tops of the jars clean so that the lids will make a good seal. Using tongs, lift the lids and rings out of the boiling water and place them on top of the jars. Screw down to form a tight seal. Process the jars for 10 minutes in a boiling water bath. Remove jars and set on a towel to cool. After a while, the lids will pop down, indicating a good seal. After the jars are cool, label the jars and store in a cool, dark place. Six lovely jars of homemade strawberry jam. Uh oh, I forgot to skim the foam off. You can see the whitish foam in the jars. That isn’t mold, it’s just foam. Also, my fruit floated. These are considered technical flaws. These jars won’t win any prizes at the county fair on appearance, but the preserves sure taste great on a homemade biscuit. 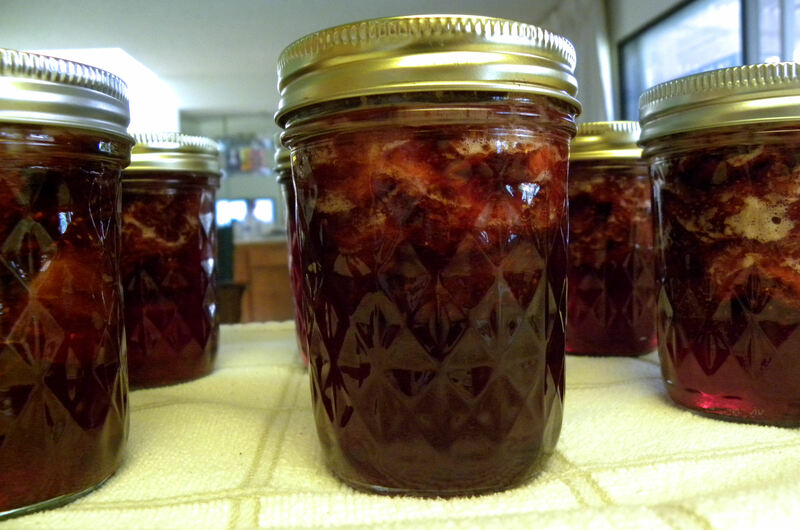 This entry was posted in Uncategorized and tagged home canning, jam, photos, preserves, recipe, strawberries, strawberry, video. Bookmark the permalink. I’m going to be making strawberry jam soon. I so love it. That and raspberry are my favorites. Daphne, I’ll bet your preserves are fabulous. And lucky you, you will get to make it from your own berries. Holy Cow, Clare, 28 jars of anything is far more than I can imagine. Congrats. I made some couple months ago, I couldn’t skim out all the foam and some fruits floated to the top. Ha, Mac, then I’m not the only one who makes great tasting but non-prize winning preserves.